Where is your Spring? Ours is here, AG Gallery. 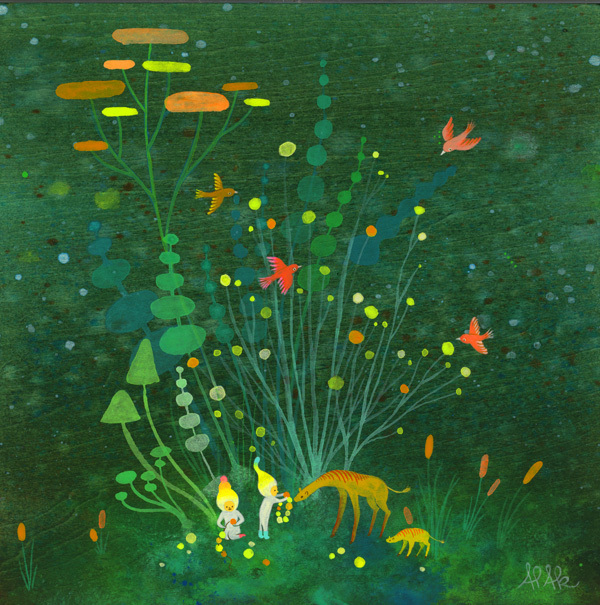 Currently, many of new art prints which are perfect for your new season’s room decor are on display: the works by one of our favorite artists, APAK (Aaron + Ayumi) from Portland, OR. Most of prints were all gone in few months, so we just received some of back-in-stocks and brand new ones. 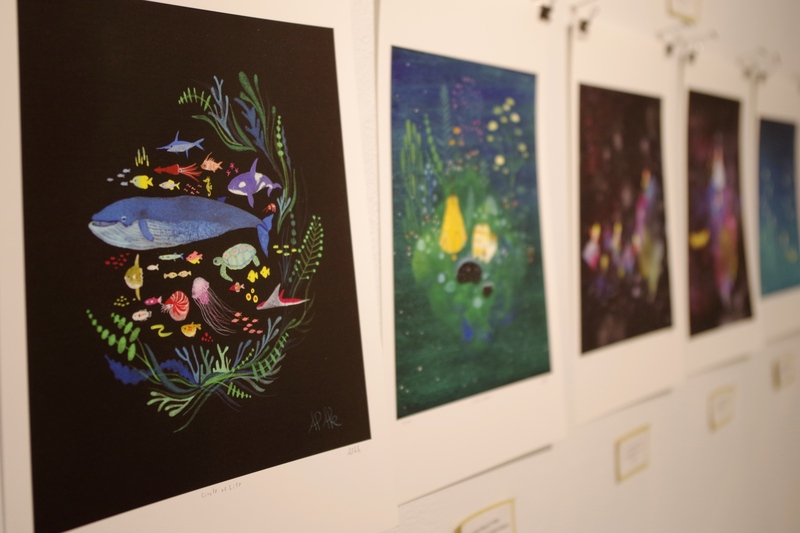 As many people love their works so far and we have been asked so many times about them, we did a brief interview with Aaron and Ayumi about them and their works. Hope you enjoy and get the idea how their unique and sweet art pieces are created. Q: Please tell us about yourself. A: We are Aaron and Ayumi, a husband and wife team. We make art together under the name APAK. We live on the outskirts of Portland under giant fir trees near a beautiful creek. We have a 3-year-old son who keeps us exploring and inspired. Q: How you guys take creation process? A: Our collaboration is unique. 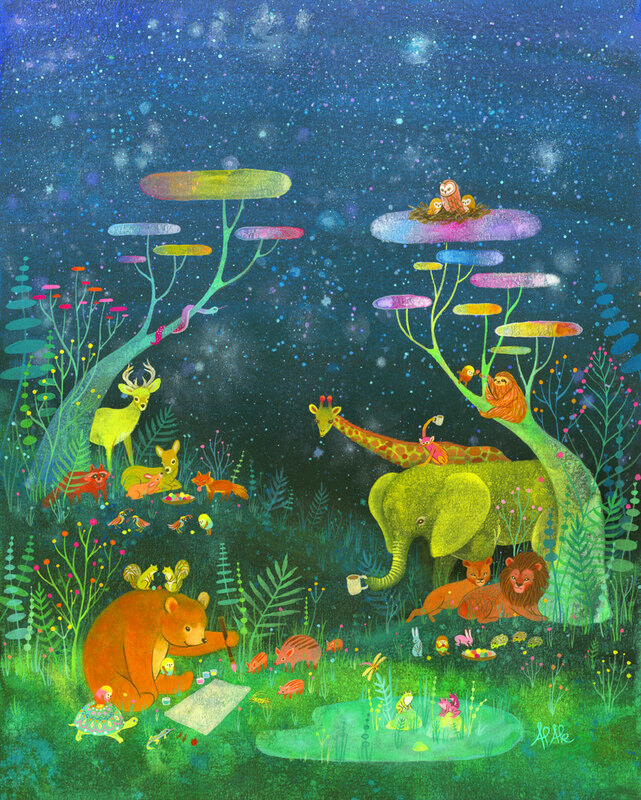 Aaron creates a surreal background and Ayumi comes in with her playful creatures to explore. We use our strengths to create an original work of art that we couldn’t create as individual artists. There is magic in collaboration. Q: When you become artist/illustrator? A: We both went to college for illustration which is where we met. We used to do work for various clients individually but after we settled in Portland in 2005, we started collaborating for the first time after being invited to a show here in town and we just felt like it was such a natural way for us to make art. We have committed ourselves to APAK ever since! Q: What’s the main resource for your creative inspiration? Ayumi: I am interested in the interrelationship among all living things especially the family, couples, friends, communities, and animals. It’s essential for us to connect and work together in life. Also I’m interested in other worlds and dimension that we are no longer sensitive enough to notice. Aaron: My inspiration comes from nature, trees, plants, colors, mountains, rivers, rocks, clouds and the infinite patterns that nature creates. Looking closely at the natural world brings me deep joy that I try to share when painting. Q: What’s the most important thing to keep in your mind when you create your works? Ayumi: I always keep a playful and innocent mood when I come up with ideas. Aaron’s magical environment inspires my imagination how to enjoy the awesome places. And also the harmony and peace are naturally nestled in my mind. Aaron: There are no boundaries and anything is possible with art.